What is truth? Truth conforms to reality. What is reality? One definition is: “the state of things as they actually exist“. That is how we determine truth. 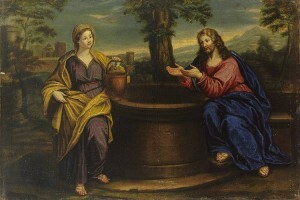 During Lent, one of the Gospels that is read each year is the story of the Samaritan woman at the well. This was what we would call today, her “job.” You and I get up everyday and go to work, just as this woman did. However, this day, her life would change. Let’s review the story. A woman came along to draw water from the well, and Jesus said to her, “Give me a drink.” The woman replied to him in reality and truth, “How can you a Jew ask me, a Samarian woman, for a drink?” The author adds for our edification, “…For Jews use nothing in common with Samaritans.” The two countries were at odds with each other. Samaritan woman were to have nothing to do with Jewish men. Jewish men were to have no relationship with women who were not Jewish. For both parties, they were still in their own realities and within the boundaries of the existing state of things..
As is usual for Jesus, he stretches the boundaries and enhances the truth of the teachings of this world. Here is where the two characters begin to separate in both reality and truth. It is important to listen to this as a dialogue between God and one of his created human beings. The lady replies to Jesus, “Sir, you do not even have a bucket and the cistern is deep; where then can you get this living water? Are you greater than our father Jacob, who gave us this cistern and drank from it himself with his children and his flocks?” That is reality as she knows it from her background. The woman sees the blessing, although skeptical, of someone who could ease her burdens here in this life. “Sir, give me this water, so that I may not be thirsty or have to keep coming back here to draw water.” The woman sees, conceptually, “this guy may have something.” If she can skip this trip to the well each day – the means she doesn’t have to walk the dusty roads, put up with guys making lewd remarks to her and not respecting her as a person, and she won’t suffer thirst herself — that presents a pretty intriguing proposition. She is willing to listen to more. Jesus answered her, “You are right in saying, ‘I do not have a husband.’ For you have had five husbands and the one you have now is not your husband. What you have said is true.” She is dumfounded. Suddenly, this woman’s eyes are opened. Jesus has put her finger on her thirst. This woman is looking for something material to satisfy her thirst. One can only speculate what “the five husbands” means, but what Jesus is saying is, “You are looking for a ‘life companion’ and I am that companion. I will satisfy your every need and add eternal life to it as well.” Jesus has spoken truth to her. She wants love, unconditional love that will allow her to be free and be loved for the person she is and could become. Jesus offers you and me this living water as well. Are you like the woman at the well? “Jesus, give me a job, and I will be happy. Jesus, give me a spouse and I will be happy. Jesus give me ________, and I will be happy.” You are dealing with your reality and your truth. Jesus has not deprive us of these things because he is not a loving God. Sometimes we must be deprived until we understand that if he meets our “human desires,” we will only be thirsty again tomorrow. What would happen if, instead of asking Jesus to change the circumstances we are finding frustrating, we ask God to give us appreciation for what we have and see how this can help us grow, both in experiencing his love for us, but also our love for Him? Maybe that would quench our thirst. Instead of looking forward to some day in the future when we will be happy, why not be happy today? If you had an encounter with someone who just exposed your most intimate thoughts and actions, would you run around town saying, “Hey, everyone, come meet a guy who just told me all the inner secrets of my life?” When she asked “Could this possibly be the Christ?” she showed that she had taken a drink from the living water. She cast aside all pretense, all fear, and all pride. Her focus was no longer on what people thought of her; she knew what God thought of her. She was loved for who she was, not what she had done or not done. That is reality and that is Truth. Are you tired of going to the well? “All you who are thirsty, come to the water! You who have no money, come, receive grain and eat; Come, without paying and without cost, drink wine and milk! (Isaiah 55:1).